Head long, narrow, flat skull, wedge-shaped without emphasis of cheek muscles, well filled up under eyes. Top and bottom jaws held tightly together within compressed lips. Slight stop. Foreface tapers gently to provide wedge-shaped impression, in profile similar to that seen when viewed from front. Although an illusion of being overshot can result any suggestion of snipey appearance is undesirable. Nose black. Dark to black, without light shading from iris. Relatively small, almond shaped, obliquely set and sparkling. Candle-flame shape, slightly pointed tips, placed high upon back of skull and proportionately close together. A guide to size can be obtained by bending ear forward - it should not reach eye. From nine months of age ear carriage must be erect. Entire inside of ear should face front. Leather of ear thin. Jaws strong, with a perfect, regular and complete scissor bite, i.e. the upper teeth closely overlapping the lower teeth and set square to the jaws. teeth level and strong. Well-rounded loin leading to a good turn of stifle; hocks well let down; turning neither in nor out; a 'tucked under' appearance undesirable. Thick at root, tapering to point. Set low and not reaching below hock. 'Gay' tail undesirable if displayed to excess. Ideal fore-movement akin to the 'extended trot'; hackney action not desirable; equally a 'shuffling gait' undesirable. Hind action smooth with ease and precision combined with drive, there should be flowing quality to indicate true soundness. Black and Tan. The black ebony, the tan likened to a new chestnut deeply rich. Colours not running or blending into each other, but meeting abruptly, forming clear and well defined lines of colour division. Forelegs tanned to knees in front. The tan then continuing inside and at back of forelegs to point just below elbows, the thin black line up each toe (penciling) and a clearly defined black mark (thumb mark) on centre of each pastern, and under chin. Hindlegs well tanned in front and inside with black bar dividing tan at centre of lower thigh. Heavy tan on outside of hindquarters (breeching) undesirable. Muzzle well tanned. 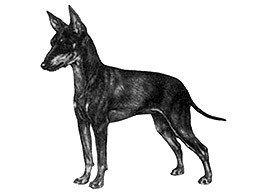 Nose black, the black continuing along top of muzzle, curving below eyes to base of throat. A tan spot above each eye and a small tan spot on each cheek. Under jaw and throat tanned, lip line black. Hair inside ears tan (tan behind ears undesirable). Each side of chest has some tan. Vent and under root of tail, tan. White hairs forming a patch anywhere totally undesirable. Ideal height: 25-30 cms (10-12 ins) at the shoulder.